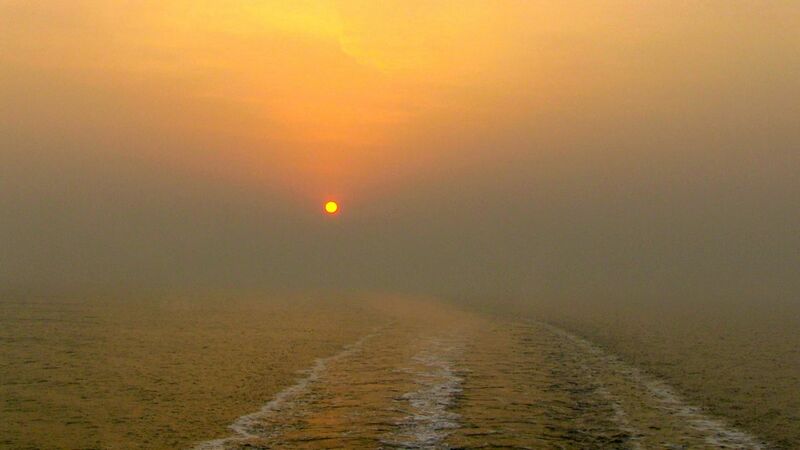 Our ship arrived in the Bohai Bay off the Yellow Sea early this morning and sat waiting for an hour or so for the pilot. He must have been early too because we got into Tianjin Port about an hour earlier than expected. There is a thick smog haze over the area, as expected. I have masks for us, in case we feel like we need them. This area suffered from very high pollution, so I'm not taking chances. This port is about 2 hours southwest of Beijing. There is what appears to be a fairly new passenger terminal here. We went out to it looking for currency exchange this afternoon, but of course the office was closed. It was probably only open for a few hours when we first arrived. We did not schedule any tours today because we are leaving tomorrow on what promises to be an intense 3 day tour in and around Beijing. It is cold here, but at least there isn't any snow. I think it got into the 50's today. There is rain in the forecast though. I hope that doesn't make the tours over the next 3 days difficult. We have been very lucky so far on this grand voyage. We are also crossing our fingers that the weather doesn't delay our flights home. We are flying Beijing to Newark and then connecting to a Newark to Orlando flight next Tuesday. Our main objective today was to pack. We took turns so we could each have room to spread our suitcases out on the bed. I went first and got my original 2 suitcases plus a new one we picked up in Hong Kong packed with my clothes and all the souvenirs we've picked up along the way. It only took me about 3 hours! Ray then started packing his 2 suitcases. As I write this he is still working on it. This is not counting our carry-ons. It's going to be interesting managing all these at the airports. At least we won't have to worry about them until then. Once we put them out of our room tonight they will be picked up and sent to our hotel. We won't see them again until we get to the hotel in Beijing tomorrow night. I don't know whether we will have an internet connection there, so if you don't see another post for a few days, don't worry. I'll keep writing and catch up the posts when we get home. We went to the Italian restaurant upstairs for dinner last night so we could say goodbye to the members of the crew we've gotten to know there. Tonight we'll eat at the restaurant downstairs to do the same with the waitress Riski and assistant Tegue,who have been so good to us there. It has been a standing joke with these two that they can predict what we are going to order, especially Ray. The crew on this ship has, on the whole, been really great. Friendly, helpful, patient, and always smiling. We will miss them.